Netherlands captain Arjen Robben says the friendly against Wales is a chance for his side to start rebuilding after failing to qualify for Euro 2016. The Oranje finished fourth in their qualifying group despite starting as top seeds. Robben, 31, has since succeeded Robin van Persie as skipper and wants to start his captaincy by beating a side who have qualified for Euro 2016. "The only thing we can do is try and restart and rebuild," he said. "It is not nice to say but we have to start again and prepare for September 2016 [when 2018 World Cup qualifying begins]. "It is a long way off but we have to cope with that reality, get some good results out of the upcoming games." Friday's fixture at Cardiff City Stadium is in stark contrast to the two sides' previous meeting, a 2-0 friendly win for Netherlands in June 2014. Then managed by Louis van Gaal, the Dutch were preparing for the 2014 World Cup - where they would eventually finish third - while Wales had failed to qualify. Now the roles are reversed, Bayern Munich winger Robben wants a positive reaction from his players. "It is funny how things work sometimes," he said. "The situation is different. They are going to the Euros we are not. It is painful but it is down to us. Wales' preparations for this game have been dominated by discussions regarding players' workloads during international breaks, with manager Chris Coleman opposing club bosses' views that players should be rested for friendlies like these. 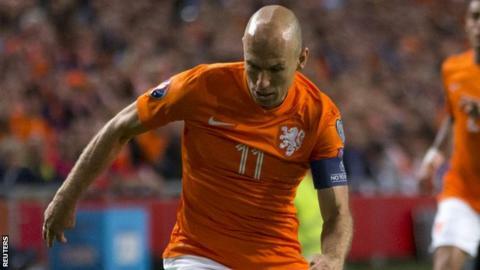 Having missed Netherlands' final Euro 2016 qualifiers in October through injury, Robben could have opted out of the game in Cardiff but the former Chelsea player believes it is an important fixture. "It matters to me - I am here," he said. "We had a good conversation about it with the coach. Bayern would prefer me to stay at the club and stabilise my physical condition but I wanted to be here. "We are building something new, this is a new project. It matters or I would not be here." Manchester United's Memphis Depay has been added to the Netherlands squad having been omitted from the original selection.